Firefox Profilemaker is an online tool that enables you to make configuration changes to Firefox by exporting those changes either to a Firefox profile or saving them as a prefs.js file instead for existing profiles. The idea is very similar to that of ConfigFox, a third-party program for Firefox that provides you with options to configure security, privacy and other Firefox settings which in turn is based on our privacy and security settings listing for the browser. The online tool walks you through seven configuration pages, each listing a distinct set of features and options to either enable or disable it. 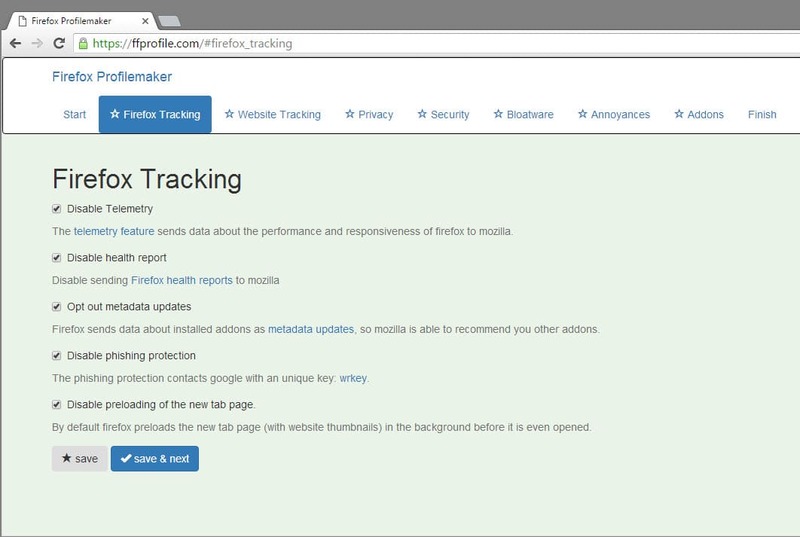 Firefox Tracking, the first of these pages for instance provides options to disable Telemetry, health report, metadata updates, phishing protection and the preloading of the new tab page. Each entry is listed with its name and a description of what the Firefox feature does which helps in the decision making process. Not all entries are enabled by default. The privacy page for instance lists several items that are not configured by default, among them an option to add a fake useragent to Firefox, to disable DOM storage in the browser, or to disable search suggestions. The add-ons page is different from the rest as it suggests the installation of third-party add-ons in Firefox. Three add-ons, Canvas Blocker, Google Redirects Fixer & Tracking Remover, and uBlock Origin, are selected by default. Two additional add-ons, uMatrix and xclear, are listed on the page as well but not installed by default. The final page lists all setting changes that you have made during configuration as a prefs.js file preview. It is theoretically possible to copy the data directly from the page, but there are buttons to download the prefs.js file as a zip to the local system, to open it in the browser, or to download a profile file instead. The prefs.js file itself does not include the selected add-ons, only the profile.zip does. Load Firefox with the -ProfileManager parameter to open the built-in profile manager. Check out our detailed guide on how to load the Firefox profile manager and create new profiles here. Create a new profile using it. This adds a folder to the Firefox profile root. The easiest way to open it is to load about:support in Firefox and click on the show folder button. This opens the current profile which may not be the profile that you have created. Just go a directory up and select it manually in the file explorer you are using. Delete all profile information and replace it with the data in profile.zip. You can load the profile directly using the parameters -no-remote -P profilename where profilename is the name of that profile. The -no-remote preference enables you to run two instances of Firefox that have loaded different profiles. Firefox Profilemaker is an interesting web service. While it is not as complete as ConfigFox or our manual list of privacy related settings for Firefox, it is easier and faster to use because of this. Mozilla asking for donations ? and I thought that Mozilla announced that they don’t need Google’s money anymore, and joined the failed Yahoo. There is every year a donation campaign in December. Leandro, I’m still waiting for that “portable directories” fix so I can give you all the ghacks configfox user.js .. any update on that? Thanks Martin it is a very useful solution. Privacy Settings contains a setting for network.websocket.enabled which was deprecated in FF35+ ( see https://developer.mozilla.org/en-US/Firefox/Releases/35 ), but other than that, it reads you settings when you open it, and changes settings when you toggle them. These changes are written to or removed from prefs.js. Just because you used some utility to create yourself some prefs.js doesn’t mean it will stay there. Privacy Settings is handy to check what you are set at. Statutory (which I’d never heard of it) looks like it’s all about the IP leak in WebRTC. Since FF42 this has been improved so that your LOCAL IP address will not leak, only that of the server (VPN I guess). See https://wiki.mozilla.org/Media/WebRTC/Privacy for more info. If you enable WebRTC, then you will want to have this setting “media.peerconnection.ice.default_address_only” set as true. If you are on FF42+ Statutory and Disable Plugin & Mimetype Enumeration are a waste of time, get rid of them. Privacy Settings is still fine. However, I have to say, this prefs.js meddling is not the way to do things, especially for a n00b. The proper way is to use a user.js which sets the prefs on a FF start. Any changes within FF will only last until you restart FF. So if you want to effectively make FF respect a set of preferences every time you restart it (which is not the same as LOCKING a preference (lock_pref)), then use a user.js ( see: http://kb.mozillazine.org/User.js_file ). 1. it reads the user.js file and applies any preferences and values set in there, even if they are default values, and writes them to the prefs.js. It ONLY applies values not commented out, it does not remove anything << this is important to understand – i.e, it does not revert any settings – you need to do that in about:config. The list on the website is a rather limited. And it's approach to writing to a prefs.js is shortsighted and just plain wrong IMO, since this website will be/is aimed at laymen – as well as the fact that prefs contains extensions data. You are better off to look at the ghacks list and ghacks user.js (which is a complete and comprehensive list), and also at ConfigFox. Be aware that ConfigFox treats commented out preferences as an instruction to remove them from prefs.js (thus resetting them to default) – but there is a setting for that behaviour under Options. ConfigFox is also not a complete, comprehensive list, because of it's default behaviour (i.e treating commented prefs as "set to default"), it confused too many n00bs, so the developer decided to only include preferences which aren't in the Firefox Options interface (which in my opinion only hides the problem (from n00bs) and doesn't fix it). The developer, Leandro, has added an option to not write to the prefs.js – i.e, it will modify the user.js ONLY, so it can act as before on a FF start, rather than remove and add to the prefs.js on the fly. I'm not even sure if ConfigFox ADDS to prefs.js on the fly or not because I am still waiting for a version to work with portable FF, but it certainly REMOVES from prefs.js on the fly (on default settings). You just need to be clear on WHAT it being done so as to not get confused. eg previous setting for user_pref("geo.enabled", false); in user.js has been applied. You comment it out in the user.js. It's still set as custom "false". But now you can change it in about:config and FF will no longer override it on startup. Capsice? Coming soon … the ghacks user.js (I am the author of the list) will be provided as ConfigFox compliant. This will be your best option down the track. But you will need to understand WHAT the settings are for – surrently the list is approx 270 preferences to do with security/privacy/fingerprinting/tracking.